The first core titles in the long running series to be rendered in full 3D, Pokémon X and Y had high expectations riding on them. The story starts off very typical, with your protagonist meeting his four neighborhood friends, being instructed to seek out Professor Sycamore, and saying your goodbyes to your mom as you all set off on an adventure across the Kalos region. The main focus of Pokémon X and Y (plot-wise) is split between two storylines – helping Professor Sycamore’s research by learning about Mega Evolutions, a temporary fourth stage of evolution that certain Pokémon are capable of, and Team Flare, the resident villain team. Pokémon X and Y are something of a return to the themes of the original Pokémon games, as Team Flare’s shenanigans are relatively simple at first. Their story does not develop as consistently or as well as previous Pokémon villain teams, though the ultimate payoff does make for a surprising, intense twist. Taking a note from Black and White, X and Y set you up against two rivals, though you will face off against one many more times than the other, denoting your neighbor Selena or Calem (depending on which gender you select for your protagonist) as the main rival. In fact, you’ll have almost as many battles with your main rival as you will have scripted encounters with your other hometown companions. New boutiques allow players to buy clothing items including hats, jackets, pants, skirts, shoes, socks, and bags, the availability of which changes each day. As for the Mega Evolutions, they don’t really alter the routine typing matchups of Pokémon battles in any significant way. Players can only use a single Mega Evolution per battle, regardless of how many Pokémon in their party are capable of Mega Evolving, so as to account for balancing issues, but there isn’t any ‘give-and-take’ mechanic at play. Mega Evolutions will make your Pokémon more powerful, but they still retain the same weaknesses to super-effective attacks. 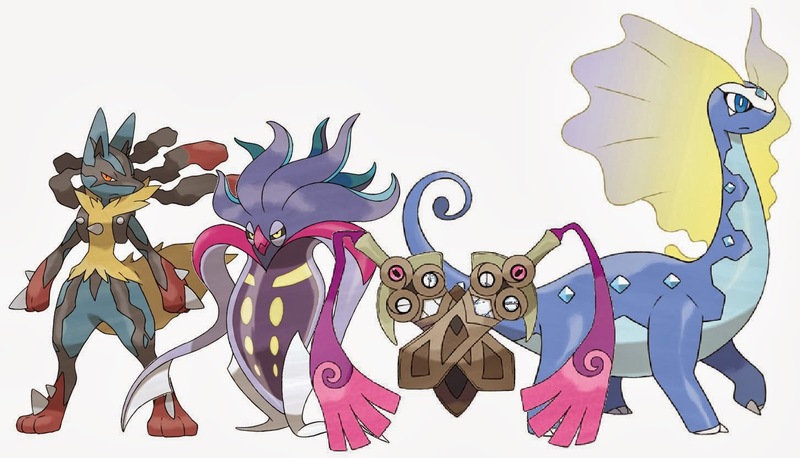 As far as the aesthetics for these Mega Evolutions are concerned, about half of them - including Mega Lucario, Mega Charizard, Mega Garchomp, and Mega Mawile – are subtle updates to the standard final stage evolutions. The other half – including Mega Heracross, Mega Manectric, and Mega Aggron – are bloated, obtuse, or otherwise generally unappealing. 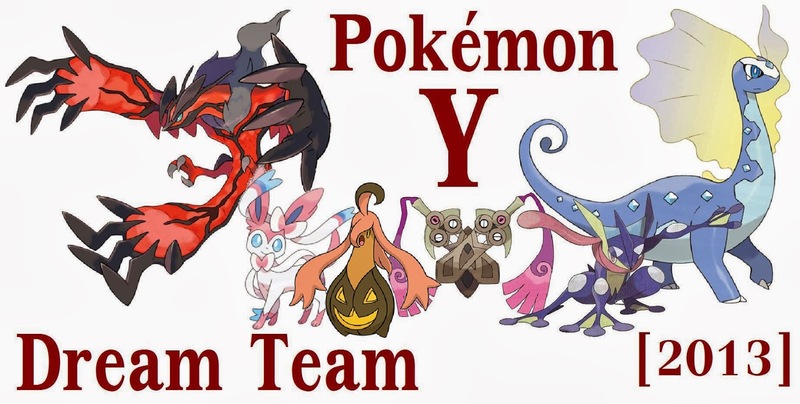 Pokémon X and Y do not introduce nearly as many new Pokémon as Black and White did. There are still version-exclusives and three new legendaries, and some of the evolution methods for these new Pokémon incorporate the 3DS hardware in clever ways. Plenty of older Pokémon make a return and can be caught in the wild, though the Pokémon new to generation six incorporate fun and interesting dual-typings, stats, and movesets. Combined with their aesthetic appearances, these lead the generation six newcomers to feel very much like an extension of the generation five Pokémon. X and Y actually perform a lot of throwbacks to past entries in the series. While you are granted one of three new starters, Professor Sycamore also provides you with your choice of a Kanto starter. Berry planting, the dowsing machine, and a postgame Safari Zone all make returns, with the latter increasing the different types of Pokémon you can catch based on the number of friends registered on your 3DS. The Battle Subway has been dropped in favor of a more fast-paced variant set within Lumiose City’s restaurants, while the postgame Battle Maison is the closest players will get to a Battle Frontier or the Pokémon World Tournament. Aside from these more competitive extras, there isn’t much to the postgame in X and Y – in fact, it feels almost nonexistent in contrast to the expansive amount of bonus content in Black 2 and White 2. And when it all boils down, the adventures you have in X and Y will be over sooner than you might hope. It will take a little over twenty hours to complete the main game. Though the new experience share item, which shares experience points with every Pokémon in your party, will cut out the need for grinding entirely, you will likely find your party members are at levels much higher than necessary by the time you face off against the Elite Four. The gym battles are plenty of fun, and the gym layouts both are highly creative and wonderfully realized. A few select areas will have you riding on the back of Rhydon and Mamoswine in order to reach plot-sensitive locations, though the controls for these sections are grid-based, and the alternating ‘cinematic’ camera angles lead these portions to feel a tad clunky in their execution, however short-lived they might be. Compared to Johto, Unova, and basically every other country that players visited in previous games, Kalos feels notably smaller. The caves are by far the most expansive and unique areas, though the various routes do incorporate some nice weather elements and landmark structures that pop visually, allowing them to stand out and thus making everything much more easily navigable. The graphical presentation is really one of the greatest strengths of these 3DS Pokémon titles. The slight cel-shading to the Pokémon models is almost as great as the dynamic and expressive stances they take in battle. The 3D functionality is only really used in battle or when you are exploring caves. 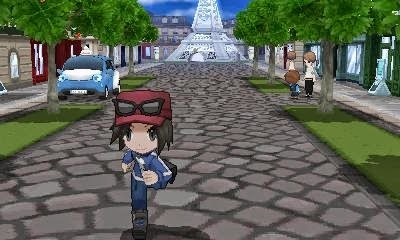 Seeing your Pokémon battle in full 3D with the added depth perception is nice touch, and though the overworld being restricted to exclusively 2D is a little disappointing, there’s often so much going on with the character models and cityscapes that it seems like Game Freak and Nintendo may have designed things this way so as to avoid giving players a visual overload. Meanwhile, the soundtrack is largely upbeat and exciting, incorporating plenty of rock vibes into its various battle themes. Pokémon Amie is a component that seeks to help ‘deepen the connection between you and your Pokémon’, as Nintendo puts it. However, this influences a new ‘affection’ meter, separate from the ‘friendship’ rating introduced way back in generation II. Whereas friendship is still utilized in order to evolve certain Pokémon like Eevee into Umbreon and Espeon, affection is primarily used to improve your Pokémons’ performance in battle. Feeding your Pokémon little treats called Poké Puffs, playing games with them, and simply petting them will raise their affection rating, which in turn can improve their chances of landing critical hits, and withstanding or even outright dodging powerful attacks. It’s a nifty little inclusion that provides some real long-term rewards. EV training, a process of boosting the individual stats of a Pokémon, previously required players to turn to spreadsheets and do a hefty amount of decoding of the games’ inner workings. Nintendo has since transformed this process into a simple and fun minigame known as Super Training, wherein individual Pokémon fire soccer balls at inflatable targets, and are rewarded with both points and punching bags to further boost their own points or to share with another Pokémon. Online components have been greatly expanded, with the ability to engage in trades and battles at any time via the touch screen. Wonder Trade is an option that will set up a random trade with anyone in the world, while the passerby list will gradually scroll through a list of many people currently playing Pokémon X or Y. You can propose trades and battles with both people on your friends list and those on the passerby list. Every element of online play boots up quickly, and performs just as well as offline play. 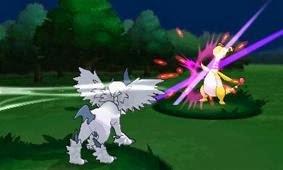 Double battles, triple battles, and rotation battles all make their returns from past games, while sky battles are added into the mix, limiting your options to Pokémon capable of flight. In the event that you have few capable airborne Pokémon in your party, you are allowed the choice to turn down any sky battles. Occasionally, walking around in the tall grass will land you a horde encounter, where five lower level Pokémon will attack your single Pokémon at once. 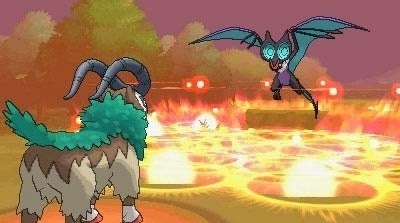 The new Fairy type Pokémon feel right at home with the previously established typings, and do more than act as a simple counter to Dragon, Dark, and Fighting type Pokémon – they provide greater incentive for players to experiment with Poison and Steel type Pokémon, both of which are super effective against Fairy types. There’s a lot of new content at play in X and Y, but when you get past the shiny new visuals, you’ll find it’s very much the same Pokémon you’ve known for years – and that’s a good thing. Jumping into Pokémon battles and figuring out typing matchups is highly intuitive, and overall the games do their best to blend the beautiful exterior with a core that relies largely on playing to the nostalgia of Pokémon fans who may have followed the series all the way through, or those may not have played a single entry since Red and Blue were released. Either way, X and Y are a lot of fun, even without much in the way of postgame adventures. While I greatly appreciated the fact that the sixth generation Pokémon games did away with the need for grinding entirely, I feel like Game Freak and Nintendo may have gone just a bit too far, resulting in certain portions of the game being too easy. I played through the core game and opted out of most sky battles, as well as breezed through a few routes without so much as looking at half of the trainers that lined it. Black 2 and White 2 were very generous in the amount of experience points they allowed you to earn, but I still felt that the later gym battles and the Unova Elite Four provided a decent challenge (and that was, mind you, after I had already faced them once in White version). While I applaud the choice of typings and freedom to select your own order within the Kalos Elite Four, the battles were almost laughably easy. By the time I entered the bright and awesomely decorated halls, my team members were all at levels that fell in the range of high sixties and low seventies, which allowed me to stomp all over the high fifties that the Elite Four relied on. Even the champion battle proved to be more or less a cakewalk, and I barely used Yveltal for any portion of these five battles. At any rate, here is the team I used to triumph over the Elite Four and Kalos’ champion – Greninja, Doublade, Gourgeist, Aurorus, Sylveon, and Yveltal. Gourgeist was a real sleeper hit of a Pokémon for me, and I feel like the ghost types from both generations five and six have been among the best the series has ever had. In fact, most of the new Pokémon introduced in X and Y work very well with all of those that preceded them because they are dual types, many of which we have not seen in these particular combinations or with these particular stats. There may not be nearly as many new Pokémon introduced in X and Y, but the newcomers do feel very much like an extension of the generation V Pokémon, which is a great thing, as far as I’m concerned. One other aspect I found myself particularly critical of late in Pokémon Y was the lack of much challenge from my rival character. Technically, X and Y do carry on from Black and White a scenario of the protagonist having two rivals. But you only have a few battles with Shauna, leaving the other neighbor kid to be your main rival. I found it very strange that, even during the last of our battles, she was relying on five Pokémon instead of six. It’s like the game was handing me victory on a silver platter. I’ve already done a little bit of exploring in the postgame, and have caught both Mewtwo and Zygarde. I had a split-second encounter with Moltres before it darted off, but considering that I previously caught one in Soul Silver and imported it into Black 2 along with Zapdos and Articuno, I’ll probably just carry those ones over into Y once the Pokémon Bank application is up and running. I’ve heard from others who have already completed X and Y that the postgame experience in the sixth generation titles is rather light when compared to other entries in the series, which is a bit disappointing. Nevertheless, I will do my best to seek out as much in the way of sidequests and bonus content as I can before posting my review (which will hopefully be up sometime next week). The payoff for the Team Flare storyline was a long time coming, but it was absolutely spectacular. It does tread into darker territory that is on par with the plans of Team Plasma in Black and White, and when the actual backstory that is tied to the villain team’s plans is delivered, it is magnificent in both scope and presentation. I just really wish the game had allowed me to be entranced with it longer. 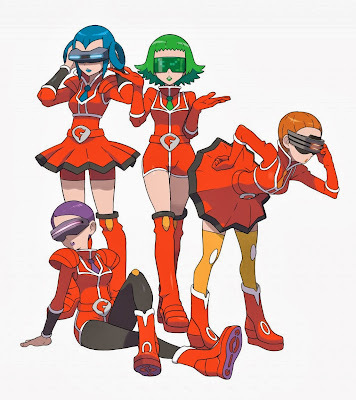 I think the sixth generation games would have greatly benefitted from having gradually expanded the role of Team Flare and their intentions instead of having them simply pop up from time to time. The grunts and admins never really feel as though they’ve developed any further as characters, though Lysander’s visible rage was a nice touch, thanks to the 3D character models. From here on out, I expect Pokémon Y to be more or less a straight shot to the finish line. I don’t imagine the last gym, Victory Road, or the Elite Four will be particularly easy (and that’s just the way I’d like things to be), but I also don't expect there will be too many extra distractions until the postgame. I am excited to visit the sixth generation equivalent of the Safari Zone, and I’m very much hoping that I run into a shiny Pokémon or two – I understand that the chances of running into shiny Pokémon has been improved for X and Y, and I already know quite a few people who have encountered shiny Aipoms, Spoinks, and Croagunks. Outside of the scripted red Gyarados from Soul Silver and the postgame reward Garchomp in Black 2, I’ve never come across a shiny Pokémon, so I’m keeping my fingers crossed. 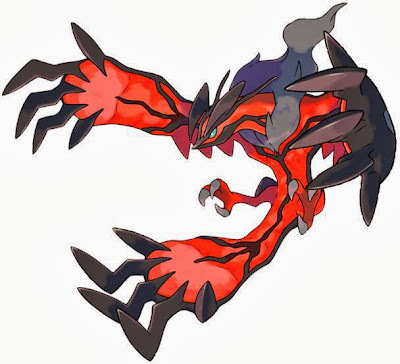 Now that I’ve caught Yvetal, I have a second Flying Pokémon in my ranks, and have decided he will more than likely replace Talonflame as I prep my team for the Elite Four challenge. I still plan to catch a Noivern, and if I decide that I like his move set and stats better than Yveltal, I may perform one last swap of my lineup. But as it currently stands, I have both a Sylveon and an Aurorus in my party, whose Fairy and Ice moves seem plenty reliable in countering any Dragon Pokémon I might encounter before the main game’s finale. Adding Noivern to the lineup seems like it might be a bit overkill. I’ve come to realize that Lumiose City only has a handful of real worthwhile things to offer. The ludicrous number of cafes act as a series of hurdles, barring you access to the large boutique unless you visit every café and talk to all the patrons within (the correlation between coffee drinkers and your own personal sense of style escapes me entirely, but whatever). The restaurants acting as similar to the Battle Subways from Black and White, albeit more speedy in their delivery of one battle after another, is by far the most engaging diversion I’ve found in Lumiose City thus far. I do get the sense that a few things like the train station will open up more of the Kalos region after the main game has been completed. I’m definitely a fan of the challenge factor that Y has dished up on the whole, though I’d hardly consider it to be consistent in that regard. The first few hours were notably slower paced in order to provide adequate time for explaining all of the sixth generation’s new features, which is just as well because there are quite a few at play from the get-go. After the third gym, the game seemed to briefly barrel forth at a breakneck speed, but has since settled for a happy medium of a pace. I’ve enjoyed the degree of challenge that the gym leaders have all thrown my way, though a couple of the most recent gyms did strike me as a being a little larger than they needed to be – I appreciate the unique aesthetic angles in each, but I’m visiting the gyms to battle my way to another badge, and I’d prefer to not have to spend fifteen minutes walking between the entrance and the gym leader. I am rather surprised that Team Flare’s role hasn’t increased much. They did manage a momentary takeover of the Pokéball factory and later bullied one Abomasnow that probably could have pummeled the lot of them, but they’re still being snarky and mischievous. All I’ve really gathered from the Team Flare grunts is that they’re greedy and still don’t recognize my character as a legitimate threat to whatever their grand plans are. By this point in both the generation I and II titles, the Team Rocket goons were annoyed with Red’s constant foils to their thievery, and both Cyrus and Ghetsis had directly addressed the protagonists of their respective generation IV and V games. I get the sense that the story has some grand direction that it wants to take, but man, it is sure taking its sweet time getting there. The online component runs incredibly smoothly and offers a quick and responsive battle system. While it is possible to battle and trade with your friends in close proximity, battles can instantaneously be offered to anyone around the globe via the scrolling ‘passerby’ row of the Player Search System displayed on the lower screen of the 3DS. This means that you could be walking down a route or in the middle of tackling a gym and receive a random battle request. These requests can be declined if you find the rules are not to your liking, or blocked entirely if you find them to be obnoxious, but they will never interrupt your gameplay on the top screen. Meanwhile, the soccer minigame used to boost any of your party Pokémon’s stats is intuitive, if not a little boring and monotonous. If you feel one of your Pokémon has a speed stat, a defense stat, an attack stat, etc. that is not up to par with where you would like it to be, you can spend a few minutes training here and there to buff it up – it has a long-term payoff, but can yield very noticeable results. Pokémon Amie is the last of these three touch screen-based additions, and despite my belief that it would be an annoying grind of silly interactions with your party Pokémon in order to make boosting their friendship rating with you easier to keep track of, it is in fact a relatively simple means of building your Pokémon’s affection rating (which is different than their friendship level). A Pokémon with full affection will perform significantly better in battle, landing critical hits, more easily, dodging some attacks, and occasionally gaining boosted experience points, all for the sake of making their trainer happy. While you cannot max out a single Pokémon’s affection rating in one go, a little bit here and a little bit there can make this process super easy and – thanks to the puzzle and berry picking minigames – actually kind of fun. I’m really glad to see the incredible creativity of the gym layouts in the generation IV and V Pokémon titles carried over and expanded upon in the sixth generation games. Though the first few gyms were relatively easy to breeze through, the fifth gym – run by the Electric type leader Clemont – provided the most notable challenge. In this case, I don’t feel that my choice of starter Pokémon would have made a significant difference in the challenge factor I experienced. I think it’s simply the case that Clemont’s Pokémon knew more powerful, generally better moves than the Pokémon trained by the previous gym leaders. It was a fun gym battle, not obnoxious like Elesa’s in Black/White (with her constant spamming of Volt Switch). As the ‘hub world’ of the Kalos region, Lumiose City is certainly full of people and places, though I don’t yet understand the need to have so many different cafes in one single area. In truth, I’ve not yet bought anything from any of these cafes, but the sheer number of them seems like overkill. The boutiques, on the other hand, are a little bit annoyingly restricted at present. It’s cool that the shops offer new clothing items each day, but barring access to the largest boutique inside Lumiose City because I’ve not yet reached an arbitrary ‘style’ ranking according to the shopkeeper is plain stupid. As for the routes between cities, they’ve been incredibly short between the last three cities. There was a neat little diversion before Lumiose City that expanded Team Flare’s role as resident villain team. But aside from a brief ride on a Skiddo and a receiving a free Lapras that I used to surf across a tiny waterway, there wasn’t much to do during this most recent leg. The Mega Evolutions have only been slightly touched upon, with the third gym leader giving me free Lucario capable of Mega Evolving. It’s an interesting feature in the sense that it makes select Pokémon temporarily more powerful, and I won’t lie that I find most of the Mega Evolutions have really cool aesthetic appearances, but the whole business of Mega Evolutions seems – for the moment, at least – very much tacked on for the sake of having another gimmick in the mix. There are quite a few small elements at play in Pokémon Y that remind me of the fourth generation games – specifically the return of planting berry trees and the dowsing machine. The generation six games do not seem to push these as much as Diamond, Pearl, and Platinum, though it is curious to see them return after being absent from the fifth generation titles. 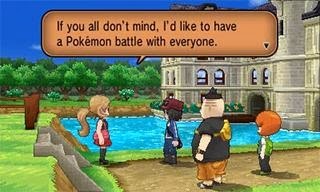 I don’t dislike the way they’ve been implemented in Y, necessarily, but I still don’t see much use for them in the grand scheme of things any more than I did in my playthrough of Platinum. The berry planting in particular seems a silly over-complication of the berry usage introduced in Gold and Silver. The distance traveled between one gym to next is generally noticeably longer than in previous Pokémon titles, and there’s a lot to do along the way. Reviving fossilized Pokémon and encountering an Eevee in the wild (similar to Black 2/White 2) shake up traditions enough and streamline portions that would otherwise be slapped on as sidequests. Team Flare’s use of Pokémon that are actually useful is also a nice change of pace, and the fact that they are gradually being introduced along with the fact that I’ve only just reached the third gym seems to imply that X and Y we be among the lengthiest Pokémon adventures of all. I’m really digging the dual types that make up a solid chunk of the new Pokémon. It makes for interesting yet intuitive battle tactics, while allowing for plenty of freedom in selecting varied movesets. I’ve swapped out about half of my previous party members in favor of using new dual types like Amaura and Inkay, and I’ve evolved my Eevee into Sylveon in order to fill the Fairy type role in my party. Between a Fairy type and an Ice type, I didn’t feel the need to keep Pancham and his Fighting moves around, though I admit that I may swap one of my current team members out later in the game in order to accommodate for Noivern or another Flying or Dragon type Pokémon (most likely, this would be Talonflame or Amaura). I’ve only sunk a few hours of my time into Pokémon Y, but holy cow is it gorgeous. Seeing the full 3D character models and upgraded battle system in the pre-release trailers had me very excited, but experiencing it firsthand is another thing entirely. Between the slight cel-shading layered over everything and the dynamic actions of the various Pokémon during battle, I dare say Pokémon X and Y are far and away the best looking 3D Pokémon titles ever created – superior even to the likes of Gale of Darkness. As I mentioned in my ‘zero entry’ for this Pokémon Y journal, Froakie was my starter, and has since evolved into Frogadier. I’m rather fond of Fletchling, as his evolutions seek to break the tradition of an early Normal/Flying bird Pokémon by having him instead become a Fire/Flying dual type. I did take advantage of the free downloadable Torchic and chose Charmander as my secondary starter, though as mentioned before I don’t intend to keep them in my party for too much longer – aside from the obvious lopsided use of Fire types in this current setup, I want to explore the new Kalos-native Pokémon to the fullest extent. That said, Pancham has potential as a Fighting type, and could fill one of the three slots not taken up by Froakie, Honedge, and the Fairy type (who will eventually comprise half of my core team). With regards to the actual gameplay, it’s quite smooth, with the frame rate in battle remaining overall consistent – every once in a while it will slow, but only for a brief couple of seconds before it is back to firing on all cylinders. The overworld controls are a little strange at first, if only for the fact that everything is still mapped onto a grid. Rolling around on skates has proven to be a more fluid and intuitive way to travel than running on foot though, and seeing as I received my skates roughly an hour into the game, it was a hiccup that course-corrected itself relatively quickly. I would say that I was a bit disappointed in the fact that the 3DS' 3D functionality only works in full during battle segments and scripted cutscenes, were it not for the fact that I feel the overworld would appear too blurry in 3D with so much going on all the time. The sheer number and variety of Pokémon you can catch within the game’s first few routes is incredible, and a wonderfully helpful first step in equipping both newcomers and veterans with basic, short-term team members that will answer all the necessary typing matchups for the first couple of gyms. The new Experience Share allows your lead Pokémon to gain half the experience it normally would in exchange for divvying the rest up among your remaining party members. In the long run, this will save boatloads of time otherwise spent on trying to balance the levels of individual team members. The same goes for the fact that experience points are now gained even after a wild Pokémon is caught, and while it does seem like Pokémon Y is doing a little bit of hand-holding right off the bat, it’s still a ton of fun to play. A new trailer for The Legend of Zelda: A Link Between Worlds has emerged, and seeks to explain some of the plot of the latest installment of Nintendo's beloved adventure series. It seems a world parallel to Hyrule, aptly named Lorule, will be key to the game's story, as resident Princess Hilda (opposite Princess Zelda) apparently has need of Link's heroics. We see a few familiar locations from A Link to the Past, such as the Master Sword's pedestal and the church, as well as more footage of some of the game's new dungeons. We also get a few decent shots of a character who we can presume to be the game's main villain, an individual clad in dark robes and wielding a magical staff. Most notable is the fact that this character has red hair, much like Link's most nefarious nemesis, Ganondorf. However, the beginning of A Link to the Past states that the Ganondorf of that timeline lost his human form and was forever transformed into the beast Ganon. And seeing as Link defeated Ganon at the end of A Link to the Past, it seems unlikely that this character is in fact Ganondorf/Ganon. However, considering that Zelda has a counterpart in Lorule, it is possible that Ganondorf/Ganon might also have a counterpart from this new world. Lorule's villain invading Hyrule would actually make a lot of sense in setting up the story and the literal link between worlds. GameTrailers has just posted the first five minutes of the upcoming DLC for Bioshock Infinite. Burial at Sea will follow Booker and Elizabeth in yet another timeline from those they hopped back and forth through in the main game, this time seeing the duo explore Rapture on the eve of its descent into chaos. As it turns out, Booker has been called upon by Elizabeth to find a young girl who went missing recently, and who he presumes is dead. However, Elizabeth promises him worthy compensation for his cooperation, as she believes there is far more to the story than what Booker has pieced together on his own. The city of Rapture looks stunningly gorgeous, and it's really cool that we get to see its populous going about their everyday lives and having relaxed conversations, entirely unaware of the chaos that is about to unfold. While I certainly hope the creative staff expands upon the use of tears in gameplay, I'm also curious to see which familiar faces make a return in Burial at Sea. In this five minute sampling alone, Booker mentions Sullivan's name, Fontaine seems to be rather important with his orphanage and Little Sisters being immediately recognized by Rapture's citizens, and there is even a poster for one of Sander Cohen's musical works on display. As I post this, we are now less than a week away from the release of the sixth generation of Pokémon games. Much like my previous Pokémon playthroughs, I plan to keep a journal running for the duration of my experience with Pokémon Y’s core game. However, unlike my playthroughs of Platinum or my recent replays of Soul Silver, I don’t have a core team nailed down yet. I want my experience with Pokémon Y to be a pure adventure with plenty of exploration of the Kalos region and experimentation with all sorts of new Pokémon matchups, much like I did when I first played through Pokémon White. That said, there are some Pokémon that are already proving quite appealing based on both physical appearances and typings, and what follows is a list of a few Pokémon I’m looking to integrate into my core team. I already know that my starter will be Froakie. In fact, I’ve known that since around the time X and Y were first revealed – it was basically a tie between Fennekin and Froakie from the start, but I gradually began to lean more toward the water starter. 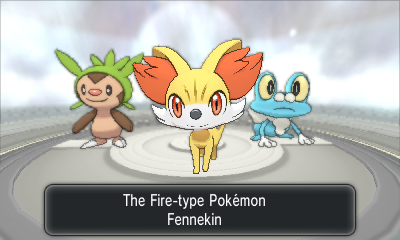 Eventually the second stage evolutions were revealed, and Frogadier’s suave look compared to Braixen and Quilladin's obtuse designs sealed the deal. As for the other two starters that will be available, I have no intention of using either the generation I starter nor the special downloadable Torchic for the main game. Mega Blaziken may come in handy for any postgame competitive play I opt to take part in, and I imagine that Mega Charizard/Venusaur/Blastoise might follow suit, but I’ve used Charmander, Bulbasaur, and all the generation III starters in previous Pokémon playthroughs, and I don’t really care to retread territory that is too familiar. The second Pokémon that I know I will be using with absolute certainty is Honedge. Ghost types and Steel types have become some of my favorites since my reintroduction to Pokémon a couple of years ago, and having both in the same package seems like a win-win scenario to me. I also have every intention of using a Fairy type Pokémon as a core member of my party, but I have not yet decided on who. Sylveon seems like a good choice, as I’ve certainly enjoyed my time with every previous Eeveelution that I’ve used. The recently leaked Klefki, on the other hand, is an interesting looking dual-type of Steel and Fairy persuasions. I just worry that having two Pokémon that fall under the banner of Steel types might present mildly lopsided battle strategies. Finally, Noivern is a Pokémon I’ve had my eye on for a while. I wasn’t immediately sold on the Dragon-Flying dual type from the early reveal trailers, but now I feel it might be a good way to complement the typings of my other party members. As for the remaining two spots, I’m open to basically anything. As Fairy is already confirmed as being supereffective against both Dragon and Dark type Pokémon, an Ice Pokémon seems a little redundant, and a Fighting type would only be particularly useful against Normal type Pokémon. To that end, I think my fifth and sixth party members will likely fall somewhere in the spectrum of Fire, Electric, Psychic, Grass, Rock, or Bug – the first four of those typings being tried-and-true, with the latter two being types that I have significantly less experience with. With all that in mind, this is but a teaser of what is to come. I’m doing little more than laying the groundwork of what I hope to gain from the 3DS Pokémon games, and these plans could change significantly between now and the days following my acquisition of Pokémon Y. I’m still blown away by what the 3DS has managed to do for the handheld side of the gaming industry, and Pokémon X and Y look like they are going to tread even further into bold new territory. Since the Pokémon franchise first debuted, its anime and video game incarnations have followed very different presentations. While the anime focused and the friendship Ash, his Pokémon, and traveling companions shared, the video games exuded more of a sense of adventure and strategy, as players discovered more and more Pokémon of varying types that might better counter opponents. 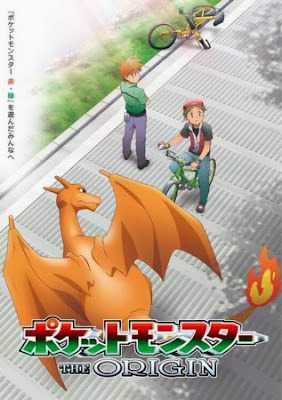 However, with Pokémon X and Y just around the corner, a new Pokémon anime emerged, paying homage to the original Red and Green Gameboy releases (or Red and Blue, as they were known in North America). This four episode special, known as Pokémon: The Origin, follows the original games almost exactly as they played out, with a brief new addition at the end tying into the upcoming sixth generation 3DS games and the Mega Evolutions set to debut therein. Red and Green, childhood rivals, are called upon by Green’s grandfather Professor Oak to choose a partner Pokémon and scour the Kanto region for any and all wild Pokémon they can find in order to complete the Pokédex. Red picks Charmander as his starter as its colors pay tribute to the name his parents gave him, while Green selects Squirtle due to its typing advantages over Charmander. The two set off on the same path, though they have notably different ideals in mind – Green wants to become the greatest trainer ever, while Red wants to learn as much as he can about Pokémon and see Professor Oak’s request through to completion. Each episode of Pokémon: The Origin presents a play-by-play sequence of events like gym battles and wild encounters that – while important to Red’s journey and his development as a character – are not the core focus of any of the four episodes. The first episode sets the stage for Red and Green’s journey, and ends shortly after Red defeats Brock – one of the few gym or trainer battles that is presented in full detail. Episode two deals with the ghost that haunts Lavender Town, Old Man Fuji’s Pokémon orphanage, and the nefarious deeds of Team Rocket. Episode three focuses on Red confronting Team Rocket’s leader and completing the Kanto league, and of course the final episode sees Red and Green face off one last time for the title of league champion after besting the Elite Four. Where The Origin deviates a little from the canon of the Gameboy titles is after Red has caught the 149 known Pokémon and then goes out of his way to seek out the mysterious and powerful Mewtwo. While Mewtwo is still encountered in the same location he is in the games, Red relies on a Mega Evolution for Charizard to defeat it, providing a quick (though not excessively forced) nod to Pokémon X and Y. The Gameboy ‘save’ and ‘load’ screens that act as bookends to each episode are a cute throwback, while the reorchestrations of classic Pokémon tunes sound phenomenal. Pokémon: The Origin is short, sweet, and very much a direct adaptation of the plot of the Gameboy games, yet it manages to convey a more human and engaging tale in four episodes than the 800+ episodes that Ash and friends have spent retreading the same simplistic challenges. 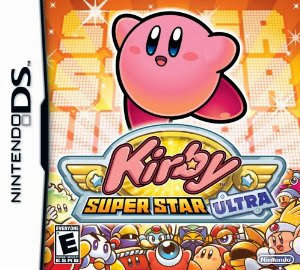 It might be strange to some, but not long after I purchased my 3DS, I found myself incredibly excited at the prospects of what a new Kirby title might entail. I quite enjoyed Return to Dreamland and The Crystal Shards, but Kirby is one of those rare series where the home console and handheld releases like Nightmare in Dreamland can convey the same style and quality of game design without having to sacrifice much in the way of presentation to accommodate for their respective consoles. As luck would have it, a 3DS Kirby title has now been confirmed for a 2014 release, and though the trailer only shows off a small preview of what is to come, I couldn't be more pleased with its offerings. Sonic joins the roster of the new Super Smash Bros.
Sonic the Hedgehog has been officially confirmed as returning for the latest installment of the Super Smash Bros. series. This comes as little surprise to me, personally, considering how much Nintendo and SEGA have bred a strong sense of partnership over the last two console generations, as well as the fact that the blue blur will be starring in his latest adventure in the Wii U exclusive Sonic: Lost World. I'm certain that many old school Nintendo fans will have fun pitting Sonic, Mario, and Mega Man against one another. And hey, even if you were not a fan of the way Sonic played/controlled in Super Smash Bros. Brawl, at least he has a unique moveset unlike Toon Link whose unnecessary return was announced a short while ago.